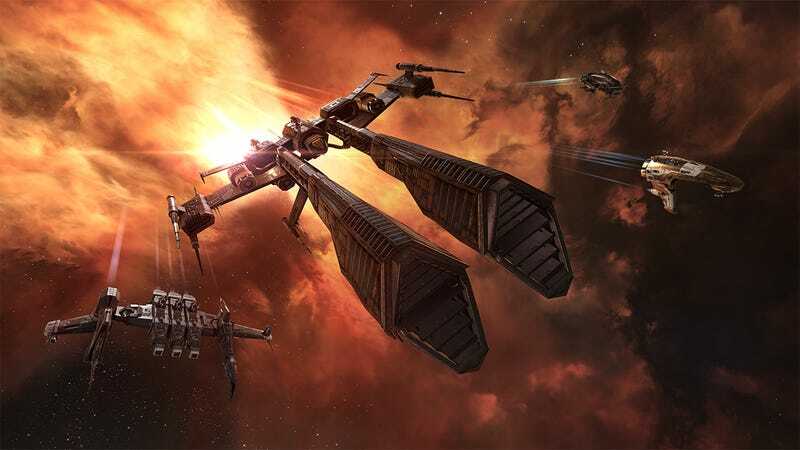 After more than a decade spent slowly building a tight-knit community of paying customers, science fiction MMO EVE Online is ready to open the free-to-play floodgates. With the introduction of Clone States in November’s big update, everybody can play EVE Online for free. Unlike other massively multiplayer online games that launch to an explosion of players and settle over time, CCP’s EVE Online has been steadily building up their community since it went live back in 2003. It was one of the first MMO games to allow players to pay for their subscriptions with in-game currency, a feature that’s helped its famous economy flourish, while adding weight and drama to player interaction. Come November, there’ll be a lot more players to get dramatic with. The Clone States feature splits players into two different groups. Omega Clones are paying customers, with access to every skill and ship the game has to offer. New and returning players without a subscription will be Alpha Clones, limited to certain ships and able to learn only a select subset of skills determined by the in-game faction they join. CCP’s posted the above explainer video about the Clone States feature, as well as a lengthy blog post detailing the limitations being imposed upon free-to-payers. As for the why, the official word is it’s all about building out the community further. Part of our vision for the future of EVE has included more open access for some time, but with the interconnected nature of the game comes vulnerability. We knew that if the flood gates were opened in the wrong way, we could see anything from server meltdowns to the collapse of the EVE economy. Over time, our hardware has improved, code has been untangled (mostly!) and we’ve found a design we believe in. Developer CCP will be flying the entire Council of Stellar Management player organization to its headquarters next month to discuss the upcoming players and address player concerns over Clone States, of which there are likely to be many.